HiFES Director, Prof. Aaron Thean was invited to be a keynote speaker for the Emerging Technology Forum held at the NUS Shaw Foundation Alumni House on MediaTek Innovation Day. The title of the talk was “Novel materials + Novel integration = Novel electronics”. The audience was certainly captivated by Prof. Thean’s vivid sharing of his “exciting research experience” in making novel electronic systems with novel materials through novel integration. 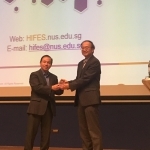 At the end of the talk, Prof. Thean shared about the HiFES research consortium partnership programme and sent an open invitation to the staff of MediaTek Singapore to participate in research collaboration.